Our small vineyard of 14 hectares spans three prestigious appellations : Bergerac, Bordeaux and Saussignac. It is a family jewel which bears the imprint of three generations of expertise. The vineyard is situated at Razac-de-Saussignac between the hillsides of Saint-Emilion 40 Km away and Monbazillac, only 20 Km distant. Acquired by my great-grandfather Marcel CAILLET in 1932, the property already had 9 hectares of vines, designed for the production of sweet wines and red wines of high concentration. 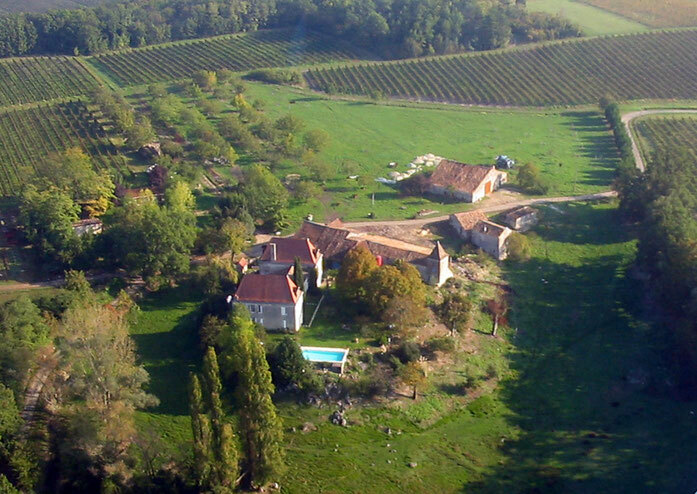 Having remained in the family, the property has been given over to the production of prestigious full-bodied wines. (Frequently 12.5° for the reds and 13 to 15° for the top quality sweet wines.) It is uniqueness of the land that makes this possible : the ground is so rocky, we have recourse to a power hammer and a rock breaker to drive in our stakes. In addition to its great poverty, the layer of cultivable soil is shallow and without reserves of underlying water. As a result, the vines suffer from a chronic shortage of water during the summer period. The yield is accordingly at a minimum but produces highly coloured and aromatic wines. In 1940, Marcel made a concrete wine container – widespread in the great châteaux of the time – which protected wines from thermal shock. Renovated in 1994, the container allows us to isolate the different grape varieties and to choose the very best for bottling. Alongside we have a more modern stainless steel container, as well as barrels for the maturation of our top quality wines. Everything is protected behind two-centuries old thick stone walls, well-suited to a trouble-free ageing.